Optimized PHPMotion Hosting With All The Features You'll Ever Need. We'll register a new domain or transfer your existing domain free of charge with all PHPMotion hosting plans. Switching to us is easy! We'll move your entire PHPMotion website from your current host hassle free. Host unlimited individual websites on all of our hosting plans. Install multiple instances of PHPMotion with ease. Install PHPMotion with our 1-click installer and have your site online in minutes! Our CSF firewall will protect your PHPMotion website from login attempts and other malicious activity. We host thousands of PHPMotion websites and can help you navigate PHPMotion if you need a hand. We're sure you'll love our PHPMotion optimized hosting but just in case we'll give you a full refund within 30 days. Install and Launch Your PHPMotion Video Site With Ease! With our 1-click PHPMotion installer you can literally have your PHPMotion website online within minutes. Using the PHPMotion you can create your own video and audio website. PHPmotion is a free video sharing software that also has support for other types of media such as audio/mp3 sharing. 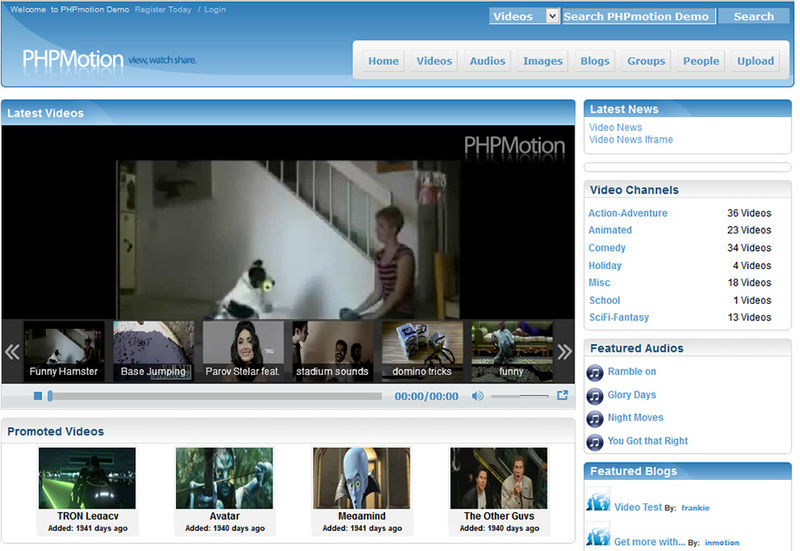 PHPMotion allows you to create and run your very own Video Sharing website, Music Sharing Site or Picture Sharing Site. Can I use any PHPMotion Themes or Plugins I want? Yes! Our PHPMotion hosting plans are compatible with ANY theme or plugins you plan to use. Whether it's a free or paid theme it will work 100%. Can I upgrade between PHPMotion Hosting plans? Yes, you can switch between hosting plans at any time and our prices are pro-rated meaning you simply pay the difference of the new plan. Upgrades are instant between PHPMotion hosting plans and there is no downtime. Can you help me install my PHPMotion theme? Yes, for a small one-time fee we can setup, configure and install your PHPMotion Theme. Simply submit a support ticket and our techs will explain the process. How does the 1-click PHPMotion installer work? Inside your cPanel hosting control panel you'll see a PHPMotion icon. Once clicked you can click 'Install' and will be guided through the steps to install PHPMotion on your domain name. "I was recommended to HostUpon by the PHPMotion support team. I run an online Animation Studio and was looking for a hosting provider that could continue to grow as my business grew. HostUpon has been our hosting provider for just over 4 years with amazing support and reliability. Simply put things just work. Speed is amazing and support is available whenever I've needed it. Nothing fancy here just reliable hosting with great support. Keep up the good work HostUpon!" Caleb O., Video Animator - Los Angeles, U.S.